The Cooroy to Curra Section C project delivered 10.5 kilometres of new 4-lane divided highway between Traveston Road, where the previously duplicated Section B ends, to Woondum Road, south of Gympie. three new bridges over Tandur Road, Woondum Road and at the Woondum ramps. The Section C project forms part of the 62km Bruce Highway – Cooroy to Curra upgrade. 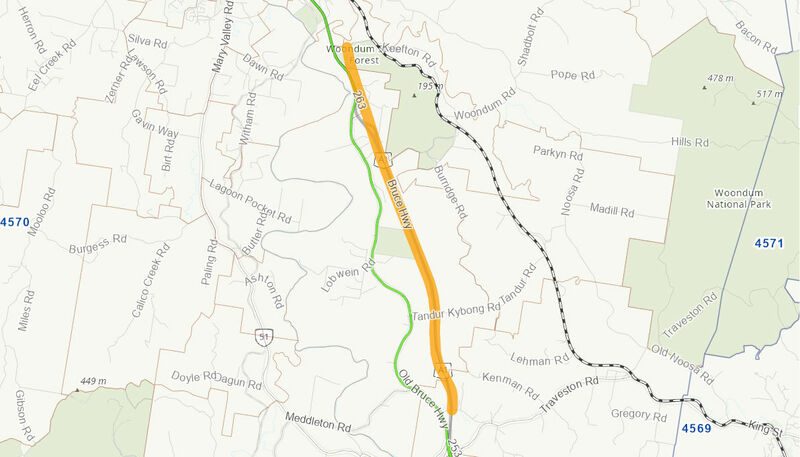 Section C is the third section of the Cooroy to Curra upgrade to be constructed and will join the completed Section B (Federal to Traveston) to the south at the existing Traveston Road interchange. The project has improved safety for road users by separating local and through traffic on a newly constructed four lane divided highway with wide median, and will provide Q100 (1 in 100 year event) flood immunity. The project will also assist in maintaining economic productivity, reducing travel times and improving efficiency, route reliability and access to the region. The Australian Government has committed up to $307.4 million towards the $384.2 million project, in partnership with the Queensland Government. Major construction commenced in early 2016 and was completed in late 2017.